In this chapter, we’ll concentrate on a kind of periodic motion that’s straightforward and that, fortunately, actually describes many real-life systems. This type of motion is called simple harmonic motion. The prototypical example of simple harmonic motion is a block that’s oscillating on the end of a spring, and what we learn about this simple system can be applied to many other oscillating systems. This is known as Hooke’s Law. Many, but not all, springs obey Hooke’s Law. The proportionality constant, k, is a positive number called the spring (or force) constant that indicates how stiff the spring is. The stiffer the spring, the greater the value of k. The minus sign in Hooke’s Law tells us that FS and x always point in opposite directions. For example, referring to the figure below, when the spring is stretched (x is to the right), the spring pulls back (F is to the left); when the spring is compressed (x is to the left), the spring pushes outward (F is to the right). In all cases, the spring wants to return to its original length. As a result, the spring tries to restore the attached block to the equilibrium position, which is the position at which the net force on the block is zero. For this reason, we say that the spring provides a restoring force. Example 1 A 12 cm-long spring has a force constant (k) of 400 N/m. How much force is required to stretch the spring to a length of 14 cm? Solution. The displacement of the spring has a magnitude of 14 – 12 = 2 cm = 0.02 m so, according to Hooke’s Law, the spring exerts a force of magnitude F = kx = (400 N/m)(0.02 m) = 8 N. Therefore, we’d have to exert this much force to keep the spring in this stretched state. Springs that obey Hooke’s Law (called ideal or linear springs) provide an ideal mechanism for defining the most important kind of vibrational motion: simple harmonic motion (SHM). Consider a spring with force constant k, attached to a vertical wall, with a block of mass m on a frictionless table attached to the other end. Grab the block, pull it some distance from its original position, and release it. The spring will pull the block back toward equilibrium. Of course, because of its inertia, the block will pass through the equilibrium position and compress the spring. At some point, the block will stop, and the compressed spring will push the block back. In other words, the block will oscillate. During the oscillation, the force on the block is zero when the block is at equilibrium (the point we designate as x = 0). This is because Hooke’s Law says that the strength of the spring’s restoring force is given by the equation FS = kx, so FS = 0 at equilibrium. The acceleration of the block is also equal to zero at x = 0, since FS = 0 at x = 0 and a = FS/m. At the endpoints of the oscillation region, where the block’s displacement, x, has the greatest magnitude, the restoring force and the magnitude of the acceleration are both at their maximum. In terms of energy transfers, we can describe the block’s oscillations as follows: When you initially pull the block out, you increase the elastic potential energy of the system. Upon releasing the block, this potential energy turns into kinetic energy, and the block moves. As it passes through equilibrium, US = 0, so all the energy is kinetic. Then, as the block continues through equilibrium, it compresses the spring and the kinetic energy is transformed back into elastic potential energy. By Conservation of Mechanical Energy, the sum K + US is a constant. Therefore, when the block reaches the endpoints of the oscillation region (that is, when x = ±xmax), US is maximized, so K must be minimized; in fact, K = 0 at the endpoints. As the block is passing through equilibrium,x = 0, so US = 0 and K is maximized. 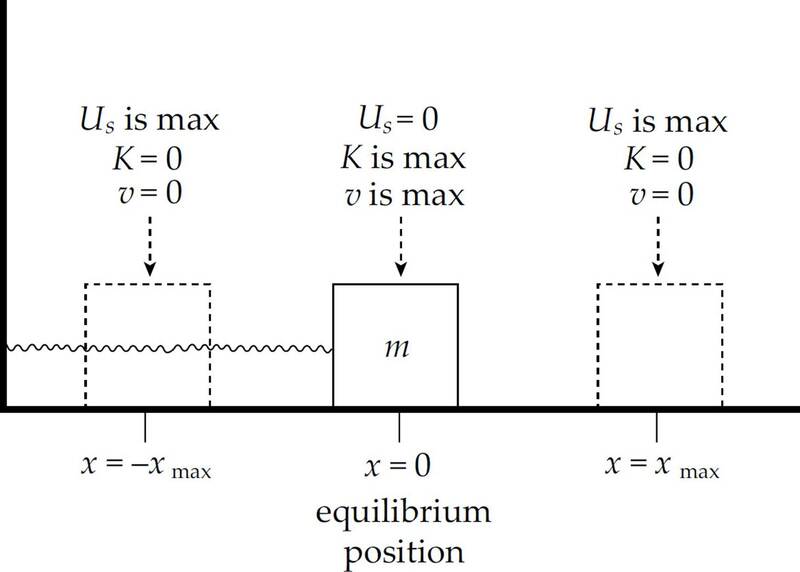 The maximum displacement from equilibrium is called the amplitude of oscillation and is denoted by A. So instead of writing x = xmax, we write x = A (and x = –xmax will be written as x = –A). Example 2 A block of mass m = 0.05 kg oscillates on a spring whose force constant k is 500 N/m. The amplitude of the oscillations is 4.0 cm. Calculate the maximum speed of the block. 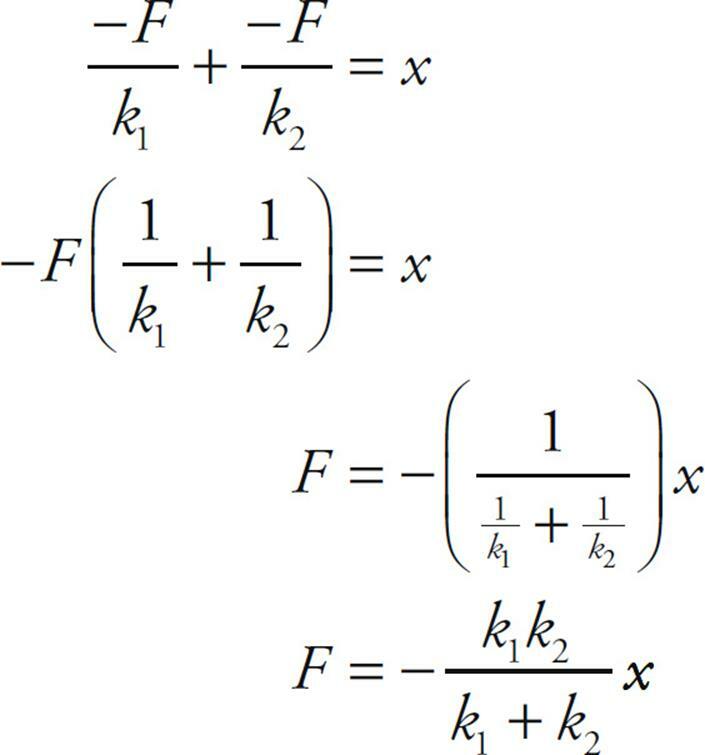 Example 3 Show why Us = kx2 if FS = –kx. Example 4 A block of mass m = 2.0 kg is attached to an ideal spring of force constant k = 500 N/m. The amplitude of the resulting oscillations is 8.0 cm. Determine the total energy of the oscillator and the speed of the block when it’s 4.0 cm from equilibrium. 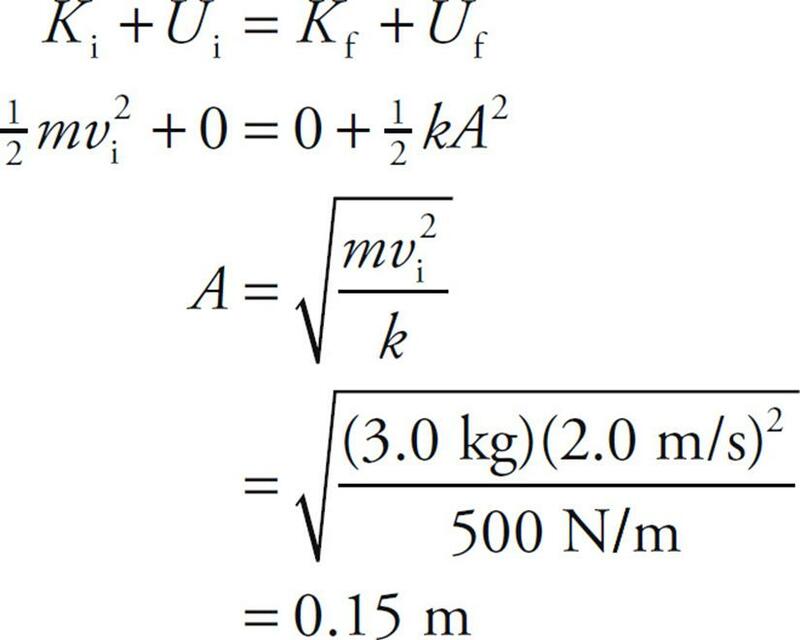 Example 5 A block of mass m = 3.0 kg is attached to an ideal spring of force constant k = 500 N/m. The block is at rest at its equilibrium position. An impulsive force acts on the block, giving it an initial speed of 2.0 m/s. Find the amplitude of the resulting oscillations. Now that we’ve explored the dynamics of the block’s oscillations in terms of force and energy, let’s talk about motion—or kinematics. As you watch the block oscillate, you should notice that it repeats each cycle of oscillation in the same amount of time. A cycle is a round-trip: for example, from position x = A over to x = –A and back again to x = A. The amount of time it takes to complete a cycle is called the period of the oscillations, or T. If T is short, the block is oscillating rapidly, and if T is long, the block is oscillating slowly. Another way of indicating the rapidity of the oscillations is to count the number of cycles that can be completed in a given time interval; the more completed cycles, the more rapid the oscillations. The number of cycles that can be completed per unit time is called the frequency of the oscillations, or f, and frequency is expressed in cycles per second. One cycle per second is one hertz (abbreviated Hz). Example 6 A block oscillating on the end of a spring moves from its position of maximum spring stretch to maximum spring compression in 0.25 s. Determine the period and frequency of this motion. Solution. The period is defined as the time required for one full cycle. Moving from one end of the oscillation region to the other is only half a cycle. Therefore, if the block moves from its position of maximum spring stretch to maximum spring compression in 0.25 s, the time required for a full cycle is twice as much; T = 0.5 s. Because frequency is the reciprocal of period, the frequency of the oscillations is f = 1/T = 1/(0.5 s) = 2 Hz. Example 7 A student observing an oscillating block counts 45.5 cycles of oscillation in one minute. Determine its frequency (in hertz) and period (in seconds). 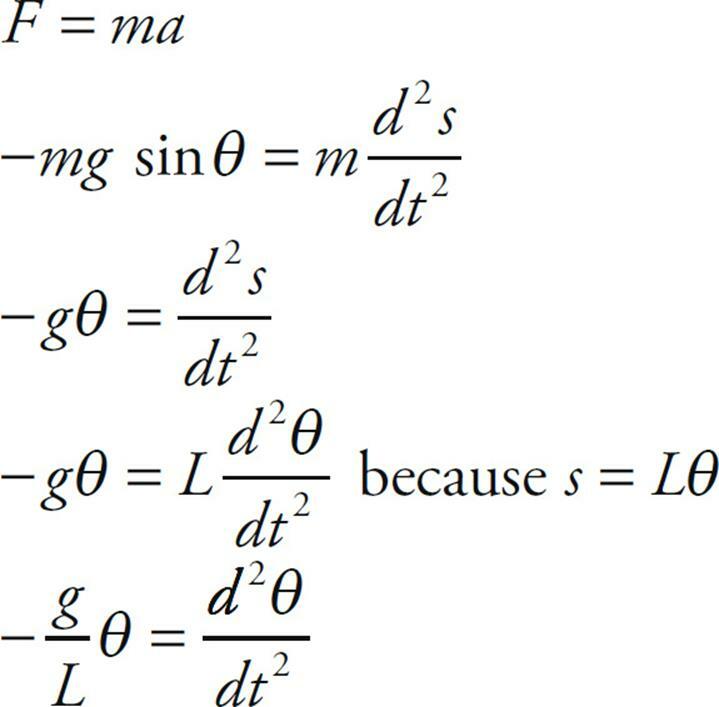 Let’s analyze these equations. Suppose we had a small mass on a very stiff spring; then intuitively, we would expect that this strong spring would make the small mass oscillate rapidly, with high frequency and short period. Both of these predictions are substantiated by the equations above, because if m is small and k is large, then the ratio k/m is large (high frequency) and the ratio m/k is small (short period). Example 8 A block of mass m = 2.0 kg is attached to a spring whose force constant, k, is 300 N/m. Calculate the frequency and period of the oscillations of this spring–block system. Notice that f ≈ 2 Hz and T ≈ 0.5 s, and that these values satisfy the basic equation T = 1/f. Example 9 A block is attached to a spring and set into oscillatory motion, and its frequency is measured. If this block were removed and replaced by a second block with 1/4 the mass of the first block, how would the frequency of the oscillations compare to that of the first block? Solution. Since the same spring is used, k remains the same. According to the equation given above, f is inversely proportional to the square root of the mass of the block: f ∝ 1/ . Therefore, if m decreases by a factor of 4, then f increases by a factor of = 2. The equations we saw above for the frequency and period of the spring–block oscillator do not contain A, the amplitude of the motion. In simple harmonic motion, both the frequency and the period are independent of the amplitude. 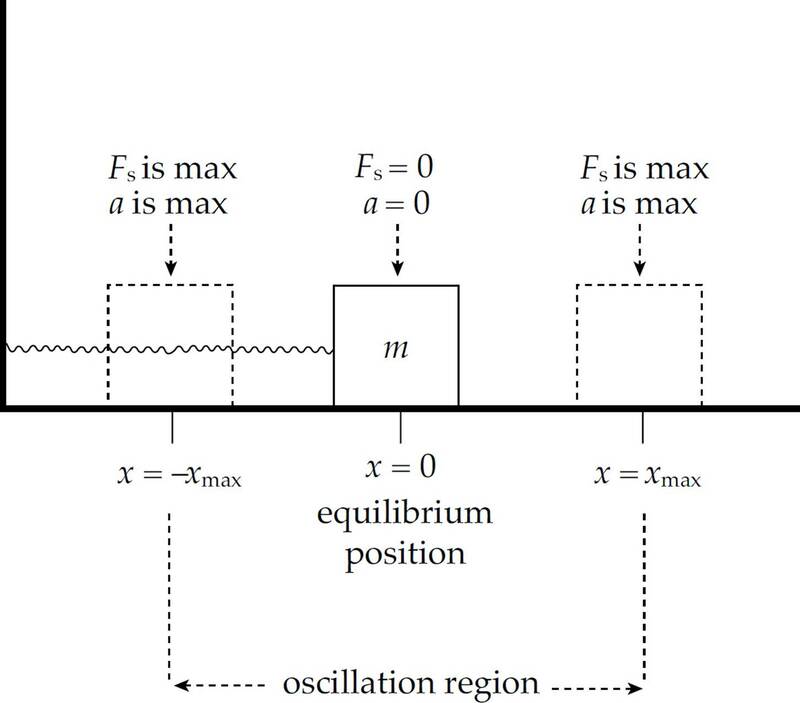 The reason that the frequency and period of the spring–block oscillator are independent of amplitude is that F, the strength of the restoring force, is proportional to x, the displacement from equilibrium, as given by Hooke’s Law: FS = –kx. Example 10 A student performs an experiment with a spring–block simple harmonic oscillator. In the first trial, the amplitude of the oscillations is 3.0 cm, while in the second trial (using the same spring and block), the amplitude of the oscillations is 6.0 cm. Compare the values of the period, frequency, and maximum speed of the block between these two trials. Solution. If the system exhibits simple harmonic motion, then the period and frequency are independent of amplitude. This is because the same spring and block were used in the two trials, so the period and frequency will have the same values in the second trial as they had in the first. But the maximum speed of the block will be greater in the second trial than in the first. Since the amplitude is greater in the second trial, the system possesses more total energy (E = kA2). So when the block is passing through equilibrium (its position of greatest speed), the second system has more energy to convert to kinetic, meaning that the block will have a greater speed. In fact, from Example 2, we know that vmax = so, since A is twice as great in the second trial than in the first, vmax will be twice as great in the second trial than in the first. Example 11 For each of the following arrangements of two springs, determine the effective spring constant, keff. This is the force constant of a single spring that would produce the same force on the block as the pair of springs shown in each case. (d) Determine keff in each of these cases if k1 = k2 = k.
Since Feff = –(k1 + k2)x, we see that keff = k1 + k2. As in part (a), we see that since Feff = –(k1 + k2)x, we get keff = k1 + k2. So far we’ve looked at a block sliding back and forth on a horizontal table, but the block could also oscillate vertically. The only difference would be that gravity would cause the block to move downward, to an equilibrium position at which, in contrast with the horizontal SHM we’ve examined, the spring would not be at its natural length. Next, imagine that the block is pulled down a distance A and released. The spring force increases (because the spring was stretched farther); it’s stronger than the block’s weight, and, as a result, the block accelerates upward. 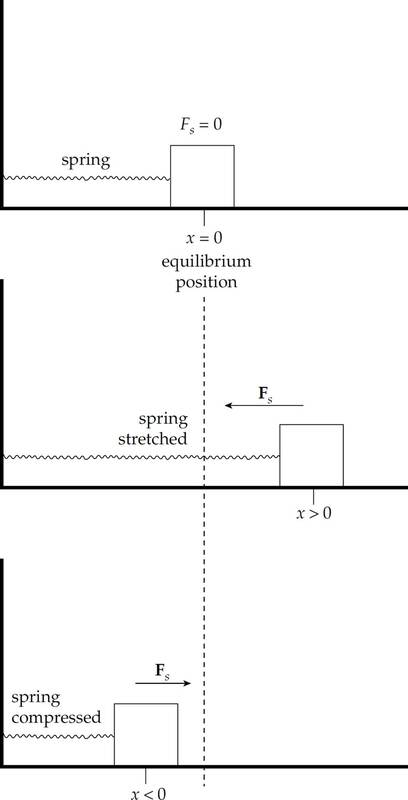 As the block’s momentum carries it up, through the equilibrium position, the spring becomes less stretched than it was at equilibrium, so FS is less than the block’s weight. As a result, the block decelerates, stops, and accelerates downward again, and the up-and-down motion repeats. but this equation becomes F = ky, because kd = mg (as we saw above). Since the resulting force on the block, F = ky, has the form of Hooke’s Law, we know that the vertical simple harmonic oscillations of the block have the same characteristics as do horizontal oscillations, with the equilibrium position, y = 0, not at the spring’s natural length, but at the point where the hanging block is in equilibium. 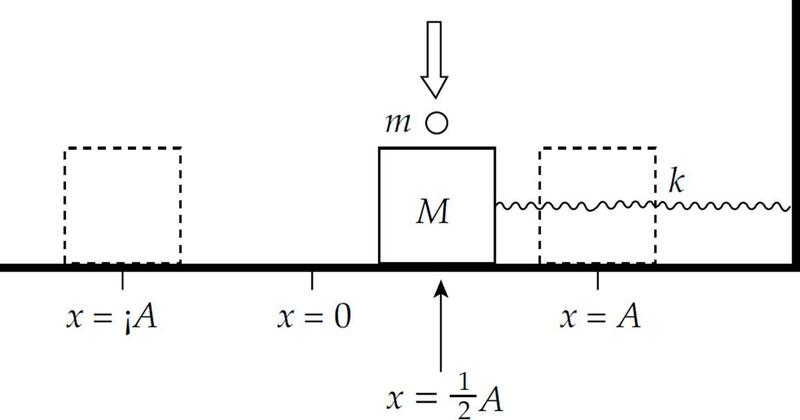 Example 12 A block of mass m = 1.5 kg is attached to the end of a vertical spring of force constant k = 300 N/m. After the block comes to rest, it is pulled down a distance of 2.0 cm and released. (a) What is the frequency of the resulting oscillations? 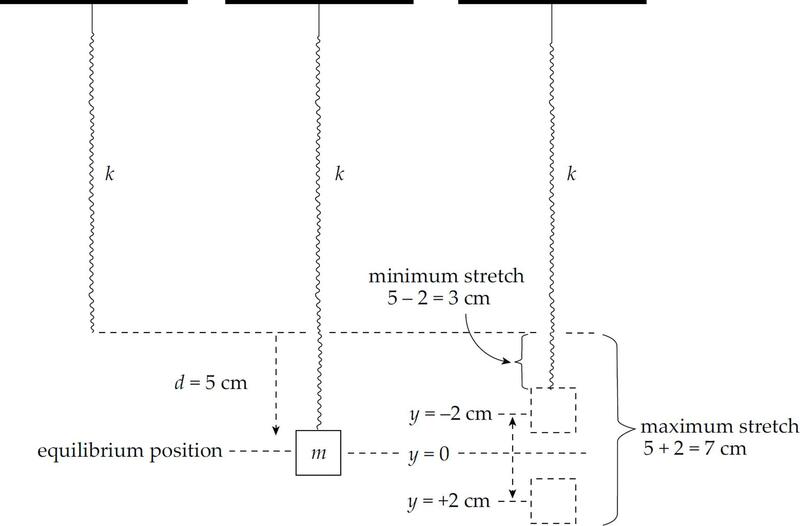 (b) What are the minimum and maximum amounts of stretch of the spring during the oscillations of the block? Since the amplitude of the motion is 2.0 cm, the spring is stretched a maximum of 5 cm + 2.0 cm = 7 cm when the block is at the lowest position in its cycle, and a minimum of 5 cm – 2.0 cm = 3 cm when the block is at its highest position. The position of the block during its oscillation can be written as a function of time. Take a look at the experimental set-up below. 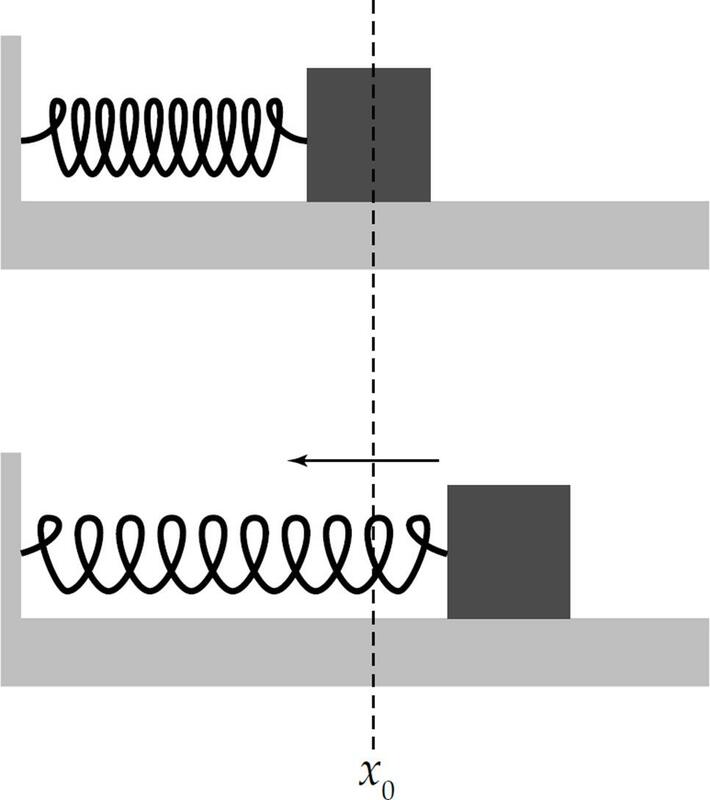 A small pen is attached to the oscillating block, and it makes a mark on the paper as the paper is pulled along by the roller on the right. Clearly, the simple harmonic motion of the block is sinusoidal. where y is the position of the oscillator, A is the amplitude, ω is the angular frequency (defined as 2πf, where f is the frequency of the oscillations), and t is time. Since sin(ωt) oscillates between –1 and +1, the quantity A sin(ωt) oscillates between –A and +A; this describes the oscillation region. Example 13 A simple harmonic oscillator has an amplitude of 3.0 cm and a frequency of 4.0 Hz. At time t = 0, its position is y = 3.0 cm. Where is it at time t = 0.3 s? (a) Where is the oscillator at time t = 0? (b) What is the amplitude of the motion? (c) What is the frequency? (d) What is the period? (b) The amplitude of the motion, A, is the coefficient in front of the sin(ωt + φ0) expression. In this case, we read directly from the given equation that A = 4 cm. (c) The coefficient of t is the angular frequency, ω. In this case, we see that ω = 6π s–1. Since ω = 2πf by definition, we have f = ω/(2π) = 3 Hz. (d) Since T = 1/f, we calculate that T = 1/f = 1/(3 Hz) = 0.33 s.
Note that both the velocity and acceleration vary with time. The differential equation, has a solution of y(t) = A sin (ωt + φ0). To check that this function, y(t), is a solution, put in the equation for y(t) and the equation for the a(t), the second derivative of y(t), and see if both sides of the equation are the same. Yes, the two sides of the equation are the same so y(t) = A sin (ωt + φ0) is a solution to the differential equation . 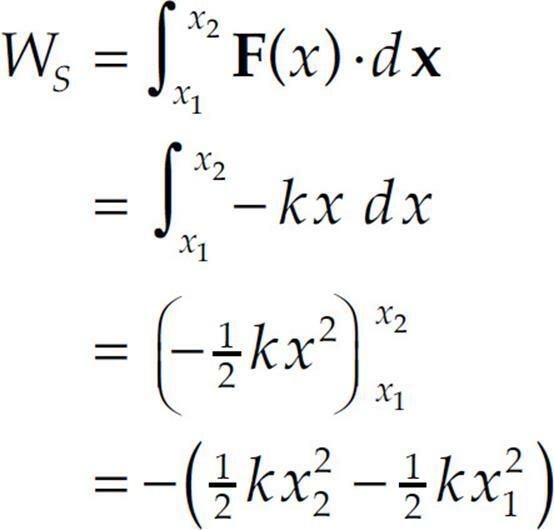 Therefore, if we can derive a differential equation that takes this form we will know the solution to the equation and that the object is undergoing SHM. Let’s do this for a spring/mass system sliding along a frictionless, horizontal floor, as shown above. where y is in cm and t is in seconds. What are the maximum speed and maximum acceleration of the oscillator? Solution. Since the maximum value of cos (ωt + φ0) is 1, the maximum value of v is vmax = Aω; similarly, since the minimum value of (ωt + φ0) is –1, the maximum value of a is amax = Aω2. From the equation for y, we see that A = 4 cm = 0.04 m and ω = 6π s–1. Therefore, vmax = Aω = (0.04 m)⋅(6π s–1) = 0.75 m/s and amax = Aω2 = (0.04 m)(6π s–1)2 = 14 m/s2. Displacement is zero at the equilibrium position. 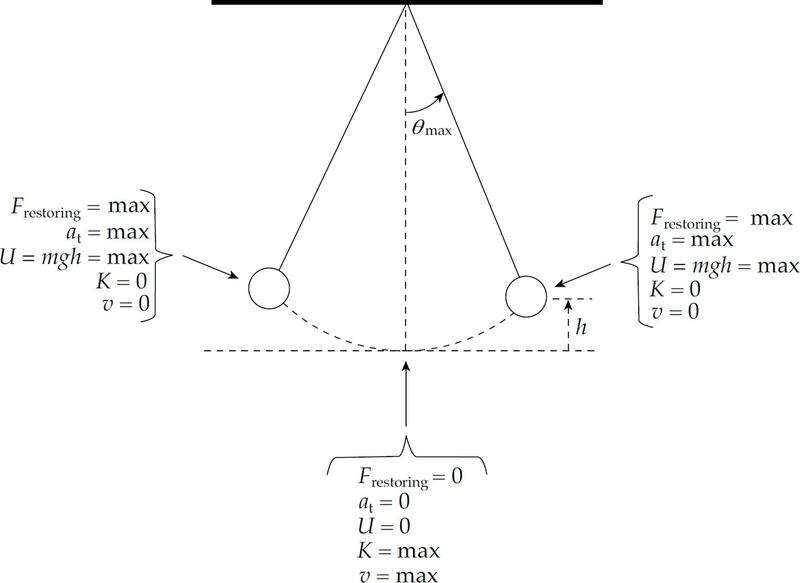 At the endpoints of the oscillation region (where θ = ±θmax), the restoring force and the tangential acceleration (at) have their greatest magnitudes, the speed of the pendulum is zero, and the potential energy is maximized. As the pendulum passes through the equilibrium position, its kinetic energy and speed are maximized. Despite these similarities, there is one important difference. Simple harmonic motion results from a restoring force that has a strength that’s proportional to the displacement. 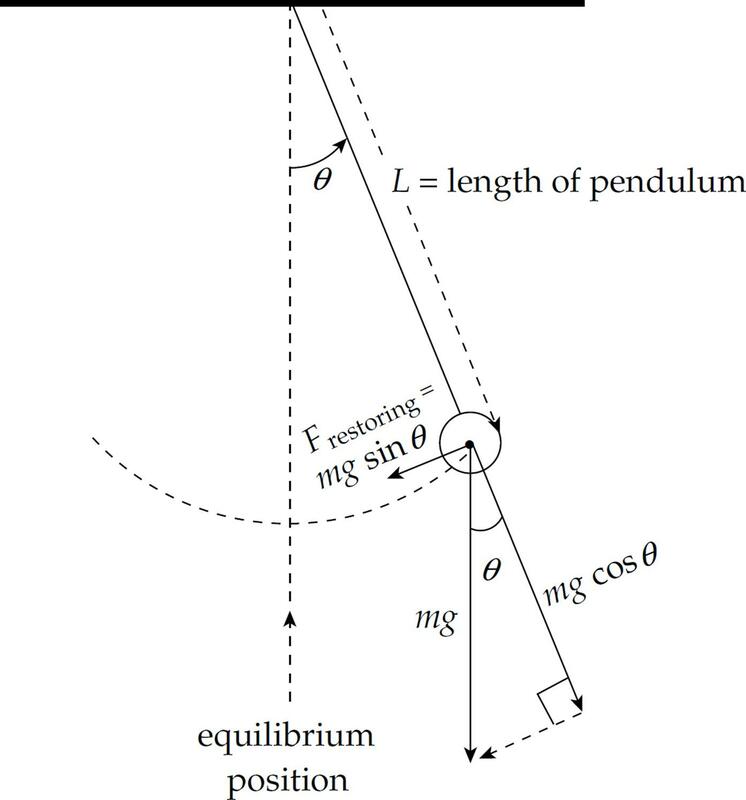 The magnitude of the restoring force on a pendulum is mg sin θ, which is not proportional to the displacement θ. Strictly speaking, then, the motion of a simple pendulum is not really simple harmonic. However, if θ is small, then sin θ ≈ θ (measured in radians). So, in this case, the magnitude of the restoring force is approximately mgθ, which is proportional to θ. So if θmax is small, the motion can be treated as simple harmonic. We have derived a differential equation for a spring-mass system that has a solution of y(t) = A sin (ωt + φo). Now we will do the same for a pendulum with small amplitude oscillations, which allows us to approximate sin θ = θ. We will use s for the arc length displacement. Consider a pendulum of length L and mass m undergoing small amplitude oscillations. This is the same basic form of the differential equation for the spring-mass system. 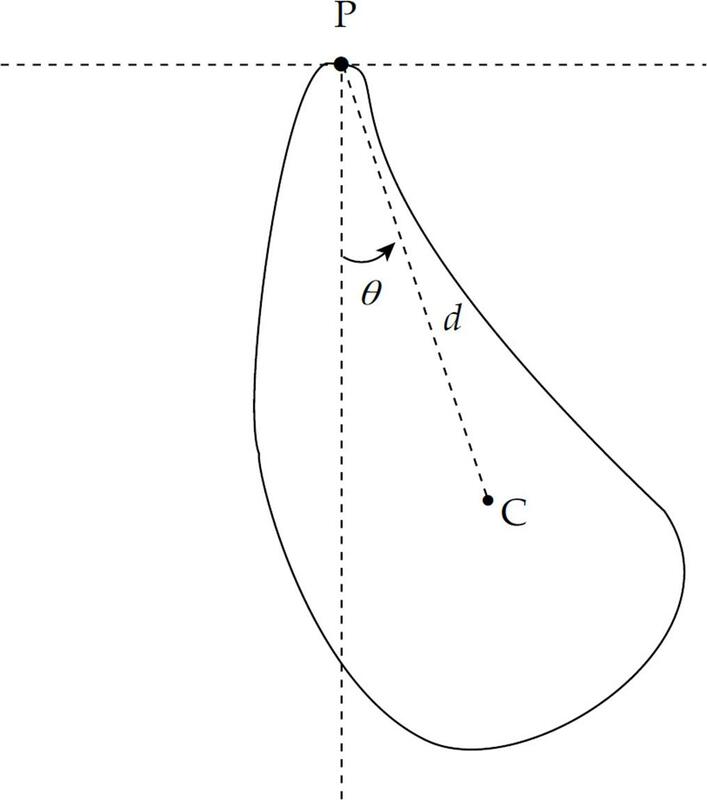 Therefore, for a pendulum:ω = and θ(t) = θmax sin(ωt + φ0). Note that neither frequency nor period depends on the amplitude (the maximum angular displacement, θmax); this is a characteristic feature of simple harmonic motion. Also notice that neither depends on the mass of the weight. Example 16 A simple pendulum has a period of 1 s on Earth. What would its period be on the Moon (where g is one-sixth of its value here)? 1. Which of the following is/are characteristics of simple harmonic motion? I. The acceleration is constant. II. The restoring force is proportional to the displacement. III. The frequency is independent of the amplitude. 3. A block attached to an ideal spring undergoes simple harmonic motion about its equilibrium position (x = 0) with amplitude A. What fraction of the total energy is in the form of kinetic energy when the block is at position x = A? 7. 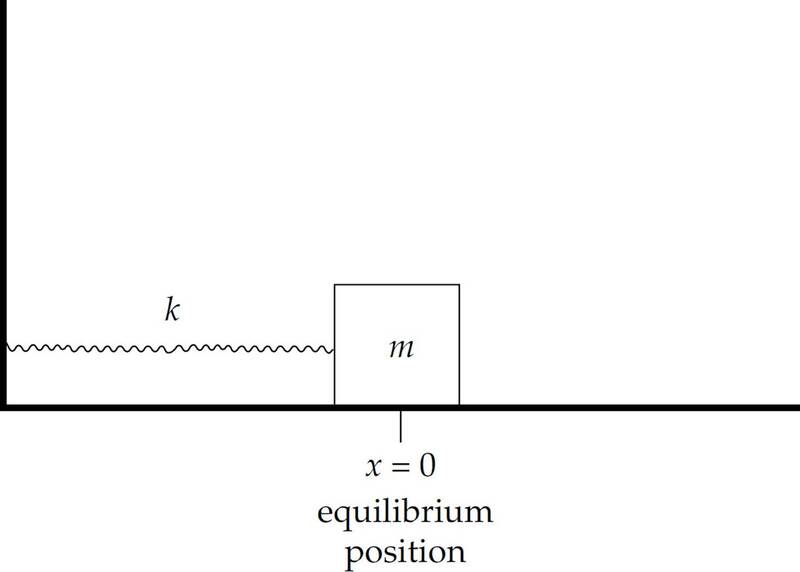 A block of mass m = 4 kg on a frictionless, horizontal table is attached to one end of a spring of force constant k = 400 N/m and undergoes simple harmonic oscillations about its equilibrium position (x = 0) with mplitude A = 6 cm. If the block is at x = 6 cm at time t = 0, then which of the following equations (with x in centimeters and t in seconds) gives the block’s position as a function of time? 8. A block attached to an ideal spring undergoes simple harmonic motion about its equilibrium position with amplitude A and angular frequency ω. What is the maximum magnitude of the block’s velocity? 9. A simple pendulum swings about the vertical equilibrium position with a maximum angular displacement of 5° and period T. If the same pendulum is given a maximum angular displacement of 10°, then which of the following best gives the period of the oscillations? 10. 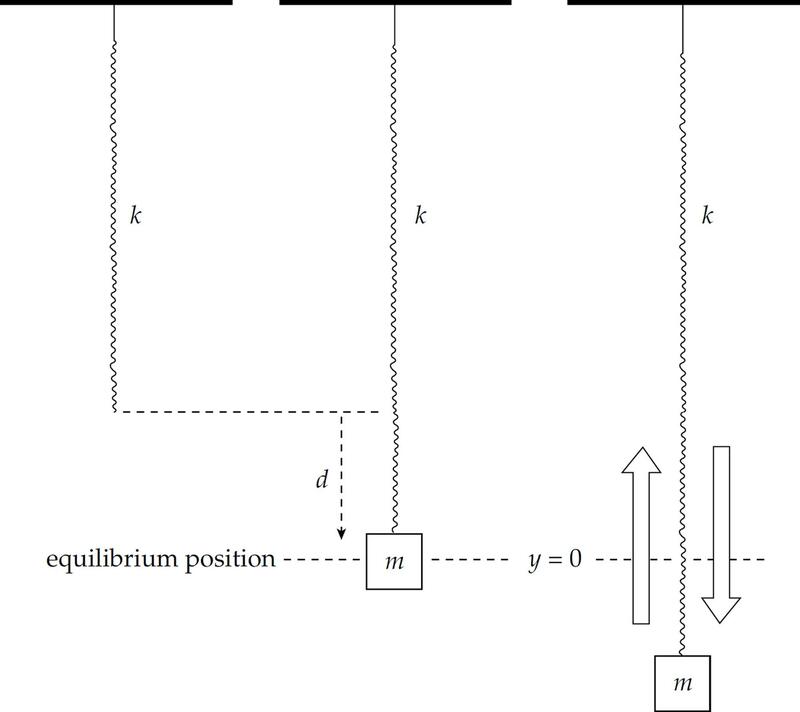 A simple pendulum of length L and mass m swings about the vertical equilibrium position (θ = 0) with a maximum angular displacement of θmax. What is the tension in the connecting rod when the pendulum’s angular displacement is θ = θmax? 1. 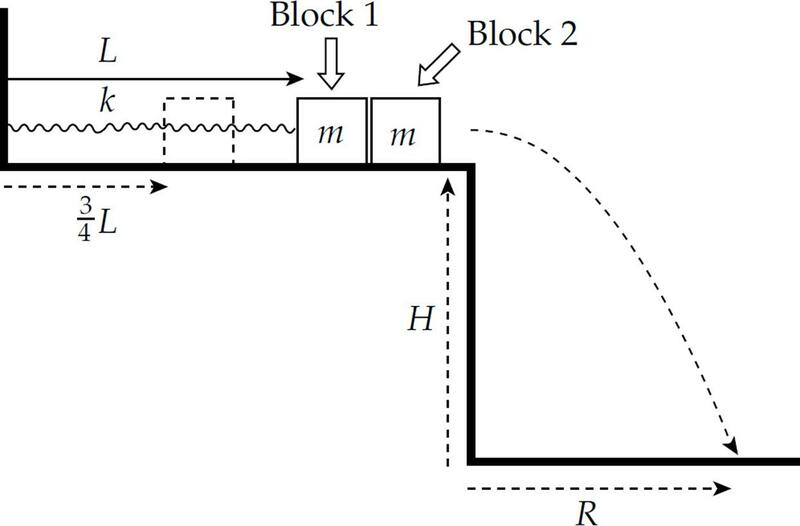 The figure below shows a block of mass m (Block 1) that’s attached to one end of an ideal spring of force constant k and natural length L. The block is pushed so that it compresses the spring to 3/4 of its natural length and then released from rest. Just as the spring has extended to its natural length L, the attached block collides with another block (also of mass m) at rest on the edge of the frictionless table. When Block 1 collides with Block 2, half of its kinetic energy is lost to heat; the other half of Block 1’s kinetic energy at impact is divided between Block 1 and Block 2. 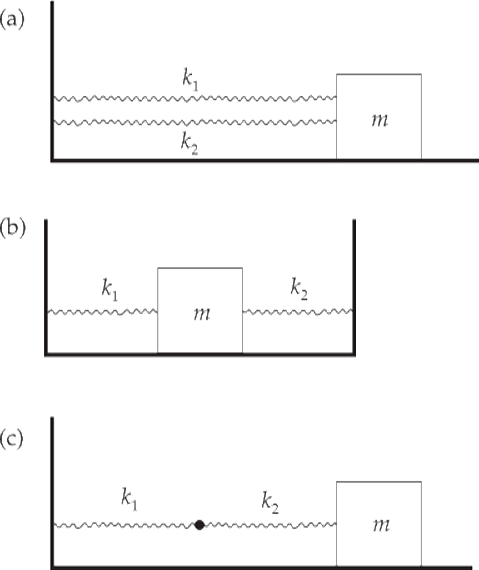 The collision sends Block 2 over the edge of the table, where it falls a vertical distance H, landing at a horizontal distance R from the edge. (a) What is the acceleration of Block 1 at the moment it’s released from rest from its initial position? Write your answer in terms of k, L, and m.
(b) If v1 is the velocity of Block 1 just before impact, show that the velocity of Block 1 just after impact is v1. (c) Determine the amplitude of the oscillations of Block 1 after Block 2 has left the table. Write your answer in terms of L only. (d) Determine the period of the oscillations of Block 1 after the collision, writing your answer in terms of T0, the period of the oscillations that Block 1 would have had if it did not collide with Block 2. (e) Find an expression for R in terms of H, k, L, m, and g.
2. A bullet of mass m is fired horizontally with speed v into a block of mass M initially at rest, at the end of an ideal spring on a frictionless table. At the moment the bullet hits, the spring is at its natural length, L. The bullet becomes embedded in the block, and simple harmonic oscillations result. (a) Determine the speed of the block immediately after the impact by the bullet. (b) Determine the amplitude of the resulting oscillations of the block. (c) Compute the frequency of the resulting oscillations. 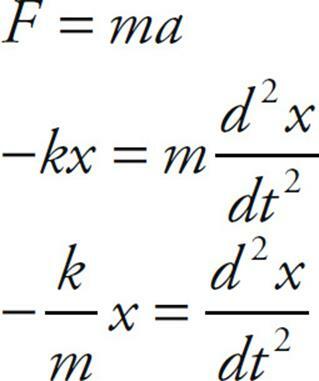 (d) Derive an equation which gives the position of the block as a function of time (relative to x = 0 at time t = 0). 3. A block of mass M oscillates with amplitude A on a frictionless horizontal table, connected to an ideal spring of force constant k. The period of its oscillations is T. At the moment when the block is at position x = A and moving to the right, a ball of clay of mass m dropped from above lands on the block. (a) What is the velocity of the block just before the clay hits? (b) What is the velocity of the block just after the clay hits? (c) What is the new period of the oscillations of the block? (d) What is the new amplitude of the oscillations? Write your answer in terms of A, k, M, and m.
(e) Would the answer to part (c) be different if the clay had landed on the block when it was at a different position? Support your answer briefly. (f) Would the answer to part (d) be different if the clay had landed on the block when it was at a different position? Support your answer briefly. 4. An object of total mass M is allowed to swing around a fixed suspension point P. The object’s moment of inertia with respect to the rotation axis perpendicular to the page through P is denoted by I. The distance between P and the object’s center of mass C, is d.
(b) If θ is small, so that sin θ may be replaced by θ, write the restoring torque τ computed in part (a) in the form τ = –kθ. A simple harmonic oscillator whose displacement from equilibrium, z, satisfies an equation of the form (*) has a period of oscillation given by the formula T = 2π/ . (c) Taking z equal to θ in Equation (*), use the result of part (b) to derive an expression for the period of small oscillations of the object shown above. Simple harmonic motion will occur when there is a restoring force on an object that is proportional to the displacement from equilibrium. An object undergoing SHM typically transforms potential energy to kinetic energy and back to potential energy in a repeating cycle. The three examples of SHM that we have studied thus far are a mass oscillating on a spring, a simple pendulum, and a physical pendulum.